Barcelona Newborn, pregnancy photography and birth photography information.Mireia Navarro. This is my artistic family photography project that aims to capture authentic and lively moments with strength on the emotions behind the scene and the aim to tell a story. The sessions are mostly based on natural light. One of the sessions I enjoy most are the photographs of newborn babies so I decided to specialize in newborn photography as a professional photographer. There is something magical about the beginning of a new life, and for me there is nothing more pure and precious than a newborn. There’s a lot of love in the air during these sessions and I feel loaded with positive energy every single time, which is such a rewarding after-effect. The parent’s excitement and happiness when they see the final images makes me feel reassured that this is the best job ever!. These sessions are ideally performed between day 7 and 10 of the newborn’s life, therefore you need to contact me during the pregnancy so we can talk about the session and book an estimated date ahead of time. Time flies and once your baby is born you will be very busy, it’s best to plan as soon as possible and leave everything ready on time. Here you can see my vision of newborn photography. 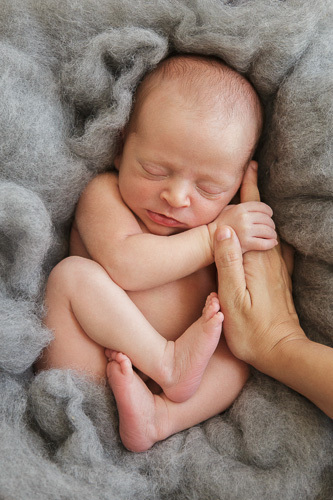 Have you ever thought about having professional photographs taken during the birth of your child? Birth photography is something that motivates me a lot and specially thrills me. I think the more important time in our lives is when we hold our child in our arms for the very first time and preserving this moment to share with him later is invaluable. I can take these photographs in a respectful, discreet and elegant way. Contact me during pregnancy to talk about it. I also offer pregnancy, children and family shootings. In case you hire a photo shoot of the newborn baby, you will have the option of having a pregnancy photo shoot at a special price. I like to offer every family what they need, so each session is unique and tailored to your specific needs. We will choose an environment and adequate time to work, either outdoors, in my studio or at home. The photo shoot is an experience in itself tailored to your enjoyment as well. I work mostly in Barcelona and surroundings, but I like to travel, so I am opened to go on location. If you need me beyond my area we can talk about it!